Under a scorching sun we went campaigning at the Mala Strana square, close to the Czech parliament. We were joined by the team of Byd Let Zit, an initiative that promotes decent housing for all. Maria Dobra and Martina Veverkova explained to us that in Czechia there is hardly any social housing. People with modest incomes have to rely on the private housing market. High demand for affordable housing is having a knock-on effect on the rent prices, that have increased much faster than wages and benefits. Housing subsidies were recently cut because the Minister for Social Affaires suspects there is a form of ‘poverty business’ by owners who exploit the scarcity of affordable housing. Byd Let Zit sues this policy and demands that prices should be regulated, investment in social housing increased and gentrification in cities stopped. In the afternoon, the ambassadors of the Czech EMIN network joined our group to have a panel discussion on the social situation in the Czech Republic. Vladimir Spidla also contributed to the debate. He argued that minimum income, as part of the broader social protection system, is a necessary but insufficient element to guarantee a decent life to people. Access to the labour market and to different quality services should also be ensured. He advocated for European support to encourage the Member States to deliver on these essential policies. 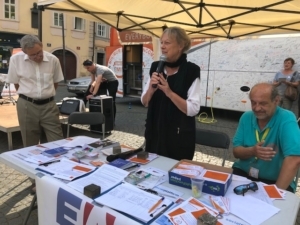 Milena Cezna, president of the committee of good will and former president of the Czech EAPN, plead for more accessible social benefits since the actual system shows considerable gaps in take-up. Lack of social housing and low paid jobs cause problems for people who are not able to pay the rent. Especially families with children live in bad housing conditions. Professor Martin Potucek regetted the absence of politicians in this debate, which proves that in Praha it is difficult to talk about social problems. People believe poverty exists only in the heads, but statistics prove that this is not true: especially elderly people andfamilies with small children live in precarious circumstances. Emil, our volunteer who has lived in poverty for years, denounced the lack of good quality services that are impotant not just for poor people but for the whole of society. Pavel Trantina from the European Economic and Social Committee referred to the new EESC initiative to draft a report on minimum income and the methodology to define adequacy of incomes. This must contribute to implement the European Pillar of Social Rights. Lidmila Nemcova from the Czech organisation for seniors, advocated for more involvement of entrepreneurs in social policies, in line with their corporate social responsibility. With this debate, our stay in Praha has come to an end. 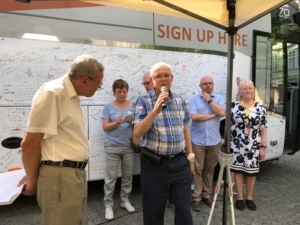 We experienced how hard it is to mobilize support for vulnerable peole in the Czech society, but we also felt encouraged by the presence of so many devoted activists, who keep their spirits up. 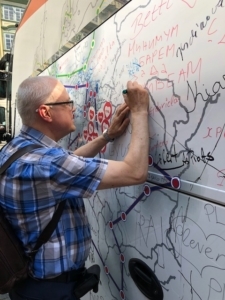 At a lovely diner on a warm summer evening, we said goodbye to Karel and his EMIN ambassadors, thanking them for their contribution to our journey.